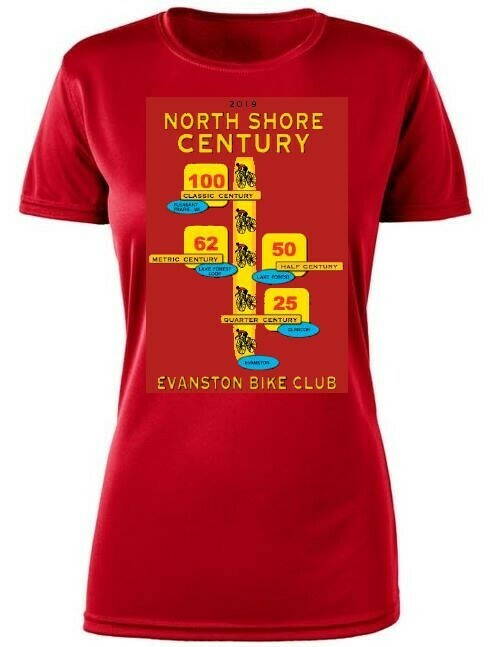 Join us on Sunday, September 15th when the Evanston Bicycle Club presents the 35th annual North Shore Century -- one of Chicagoland’s premiere invitational rides. You’ll ride through beautiful neighborhoods, view unique architectural treasures, pedal down tree-lined streets and feel the refreshing breezes of Lake Michigan while enjoying the flat to rolling countryside between Chicago and Wisconsin. 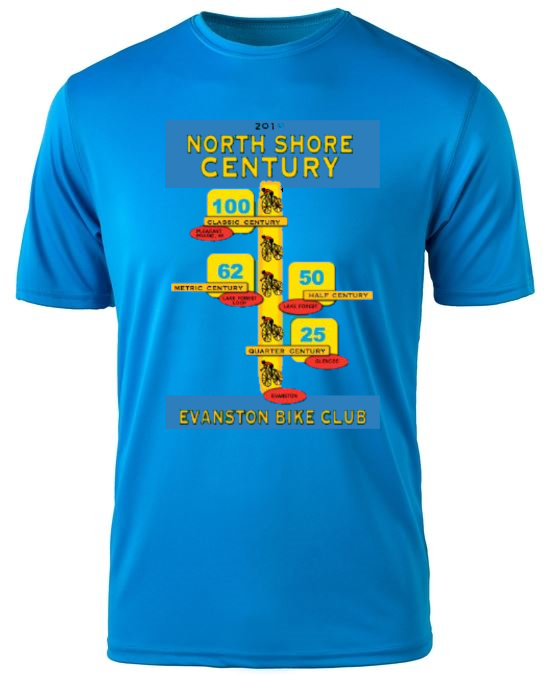 The North Shore Century features . . .
Commemorative performance t-shirts may be included with pre-registration for $20 or purchased on the day of ride for $25, while supplies last. Registered riders will receive their cue sheets and NSC wristband ID at Dawes Park. The wristband is your "ticket" to rest stop and SAG support. To speed check-in, please bring your confirmation with its QR code. Interested in riding the North Shore Century as a fundraiser for our partner charitable organizations? See details in Ride for Charity! Pick a distance that suits your abilities and goals for the day – whether that’s enjoying a leisurely ride with friends/family or challenging yourself for distance or pace. Street and Sheridan Road; we open at 6am and close at 6pm. 100-mile riders should start no later than 8am; 62-mile riders should start no later than 10am; 50-mile and 25-mile riders should start no later than 11am. Be sure you allow enough time to complete your ride before the rest stops on your route choice close. All support ends as each rest stop closes. NOTE: From 7am-11am Sheridan Road in Winnetka, Kenilworth and Wilmette will be closed to all vehicles, including bicycles. Riders encountering the closure on their southbound return route to Dawes Park should follow the detour signage/markings. Most riders will not be affected by the closure. Plan to start before 8am and leave Lake Forest by 10am. This ride starts in Evanston and stretches to Pleasant Prairie in Wisconsin in one very big loop. The southern portion takes a north/northwest route via mostly residential streets in Glenview, Northbrook, Highland Park and Lake Forest to start; the ending of the route heads south from Lake Bluff to return to Evanston, staying along the lake as much as possible, through the North Shore’s more elegant suburbs. The middle or northern portion (after leaving Lake Forest) heads west and north via Libertyville, Gurnee and Wadsworth to Pleasant Prairie (WI) and then skirts scenic Lake Michigan before heading due south via Zion, Waukegan and North Chicago; this northern section of the ride includes long stretches on busier roads. It’s a great ride for confident and conditioned cyclists. Plan to start before 10am. This ride adds a 12-mile loop onto the 50-mile route that takes you through western Lake Forest, Lincolnshire, Bannockburn and Deerfield. The loop includes a few stretches on the shoulder of busier arterials. You can decide whether you want to add this loop as you munch the goodies at the Lake Forest rest stop – so long as you make the call before noon. Plan to start before 11am. This ride goes to beautiful Lake Bluff by a north/northwest route via mostly residential streets in Glenview, Northbrook, Highland Park and Lake Forest before heading south to return to Evanston and staying along the lake as much as possible. This scenic 50-mile route appeals to both leisurely and speedier cyclists. Plan to start before 11am. This ride starts and ends with the longer rides but follows a route all its own through quiet residential streets in Wilmette, Winnetka, Glencoe and Kenilworth while avoiding busier roads as much as possible. It’s a wonderful choice for those of you who want a leisurely day out on your bike and an opportunity to see some architecturally impressive homes. Perfect for families and a great introduction for new riders. We provide three ways for you to navigate your chosen route -- pavement markings, paper cue sheets and digitally downloadable turn-by-turn directions. 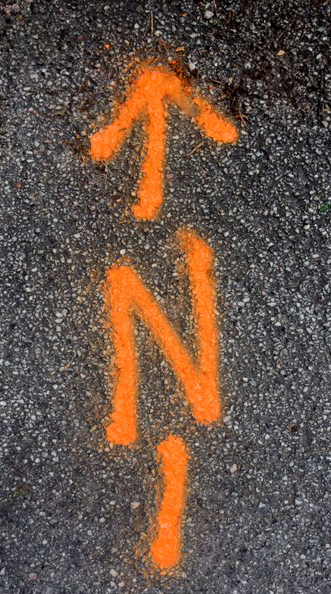 Pavement markings use orange arrows painted right on the roadway at every turn. They are put in place a few days before the ride. 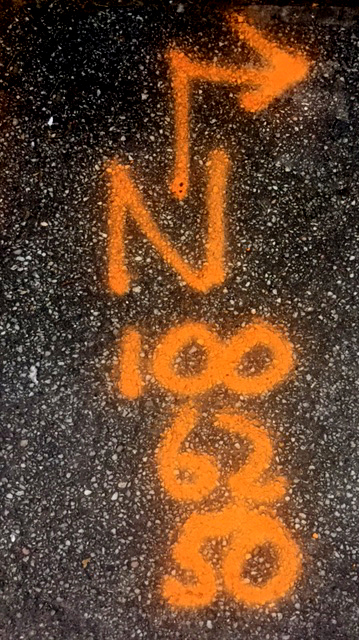 Below are 2 sample pavement markings. Cue sheets and digital downloads are produced through Ride With GPS, which we use to map all routes. They will be available online the Friday before the ride to registered participants. Paper maps and cue sheets will be provided at registration when you check in. Guidance on how to get a digital download for your GPS device will be provided here the week before the ride and will be furnished to registered participants via email. We’re famous for our food. No brag; that’s a fact. Be prepared to show your wristband when visiting a rest stop for food or mechanical assistance or when flagging down a SAG vehicle for assistance. It’s your proof of registration and contains the emergency phone number. Rest stops on all routes are stocked with fresh fruit, home-baked cookies/breads, PB&Js, nourishing snacks, water and Nuun hydration drinks. Each rest stop also has something special and unique. 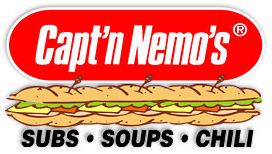 Some of the special items we have had in the past include sub sandwiches, Egg McMuffins, potato soup, grilled hot dogs, and pizza. SAG vehicles cruise all routes and can be flagged down when needed. Each SAG vehicle has a knowledgeable bike maintenance person who can help with flats or minor adjustments. SAG vehicles are also radio dispatched when the emergency number on your wristband is called. Bring a bike in good condition, with a spare tube, basic tools and a water bottle. Wear light or bright clothing to make yourself more visible on the roadway. 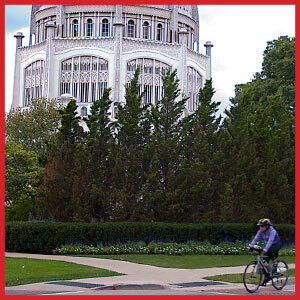 Helmets are strongly recommended for everyone; Evanston requires cyclists under the age of 18 to wear a helmet. Know and obey all traffic laws and signals/signs. Signal your turns. Ride predictably. Always pass other riders on their left and call out "On your left" or "Passing" as you do so. Our routes are on public roads that we share with motorists. North Shore communities may issue tickets for riding more than two abreast or for disregarding traffic signals and signs. For Pace route information click here. Active Transportation Alliance, Bikes N’ Roses /Communities United, Center for Independent Futures, Chicago Jesuit Academy, Chicago Women’s Elite Cycling, Citizens Greener Evanston/Streets Alive, City of Evanston/Parks & Recreation, Experimental Station/Blackstone Bicycle Works, Dare2Tri Paratriathlon Club, League of American Bicyclists, Northbrook Cycle Committee, Northshore Radio Club, The Recyclery Collective, Ride Illinois, West Town Bikes, and Working Bikes. Almost $200,000 is raised annually by our partner charitable organizations who participate in the North Shore Century as a fundraiser. If you wish to ride in the North Shore Century with these organizations, the links below will take you to their registration or donation sites.